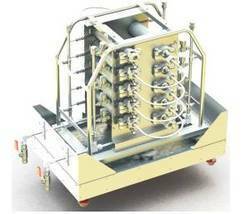 the coflore atr is an industrial flow reactor for homogenous and multi-phase fluids. Employing the same mixing principle as the lab scale coflore acr, it uses lateral movement to generate mixing and stage separation to prevent back mixing. the atr employs 10 independently temperature controlled reactor tubes mounted on an agitating assembly. Each tube has a nominal capacity of 1 litre giving an overall capacity from 1 to 10 litres. The reactor comes in its own agitator housing assembly.